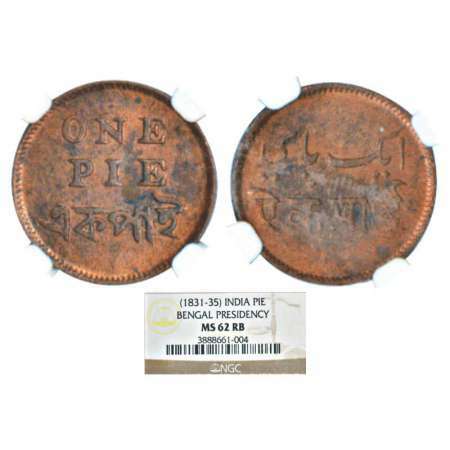 Calcutta mint, copper pie, ND (1831-1835 AD). 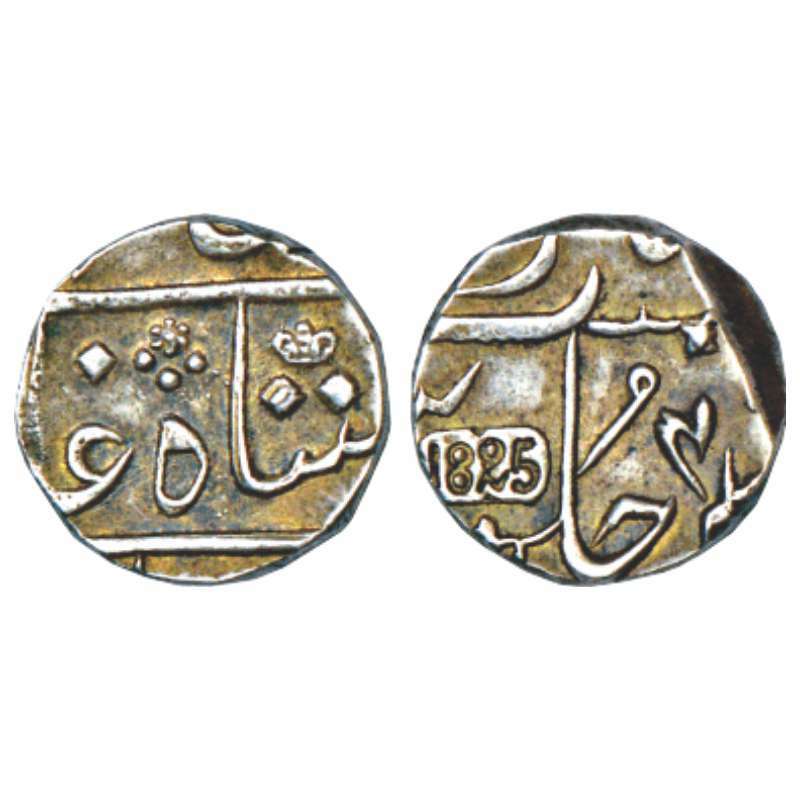 Obv: Value in English and Bengali. 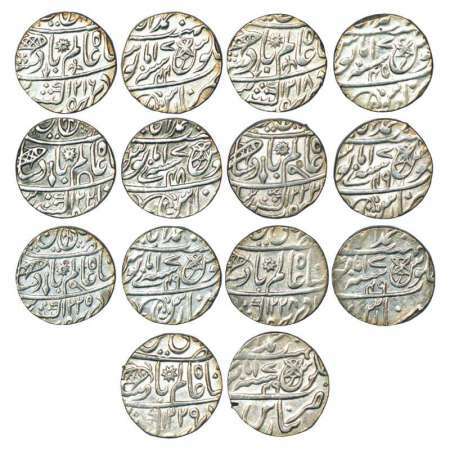 Rev: Value in Persian and Nagari; Stevens EIC 9.31; PR 215. 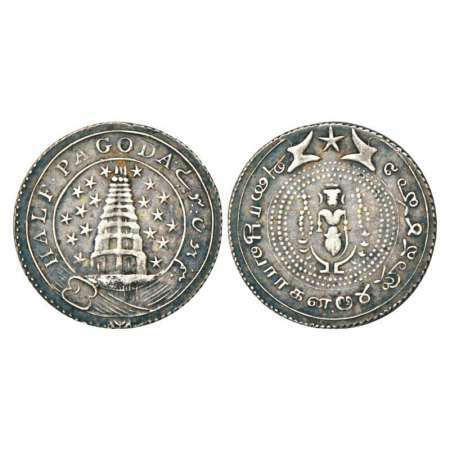 Graded as MS62RB by NGC, Very scarce. Very fine+ to extremely fine, Very scarce. 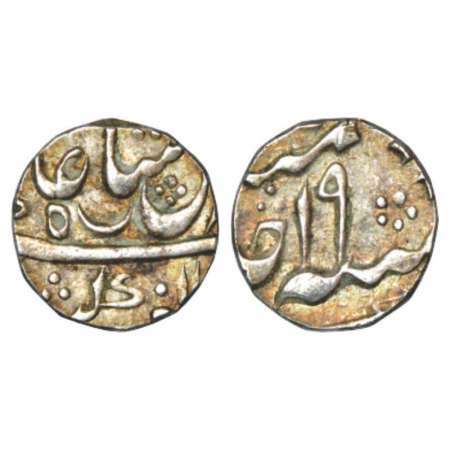 Murshidabad mint, silver ½ rupee, 5.82g, in the name of Shah Alam II, AH 119x/RY 19, PR 149; Stevens EIC 2.184-2.186. 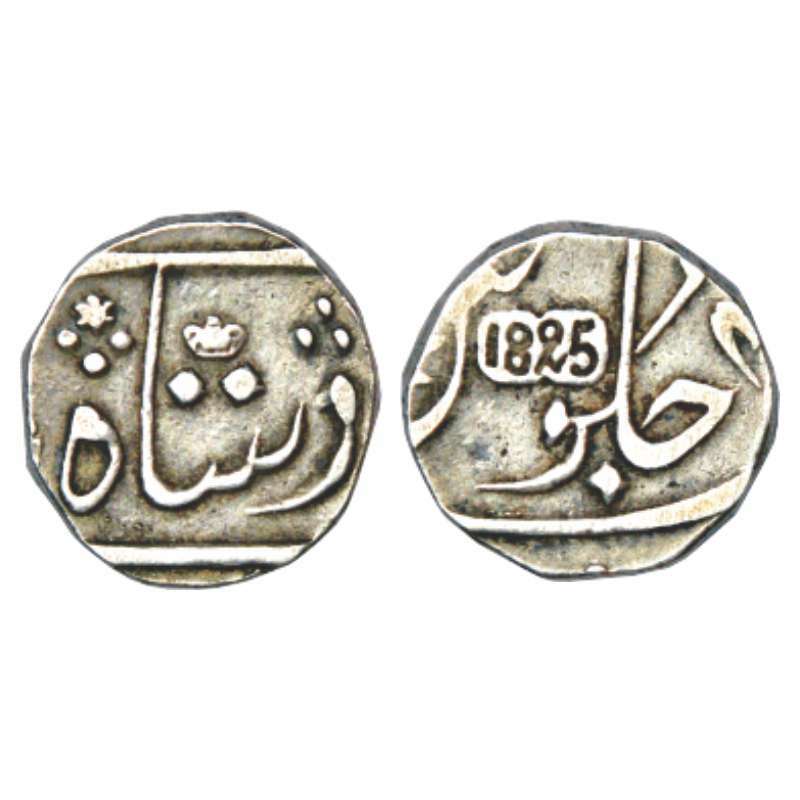 Murshidabad mint, silver ½ rupee, 5.79g, in the name of Shah Alam II, RY 19, PR 149; Stevens EIC 2.184-2.186. 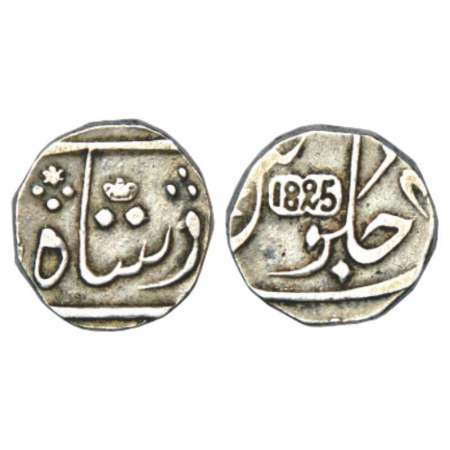 Murshidabad mint, silver ¼ rupee, 2.92g, in the name of Shah Alam II, AH 11xx/RY 19, PR 150; Stevens EIC 2.188. 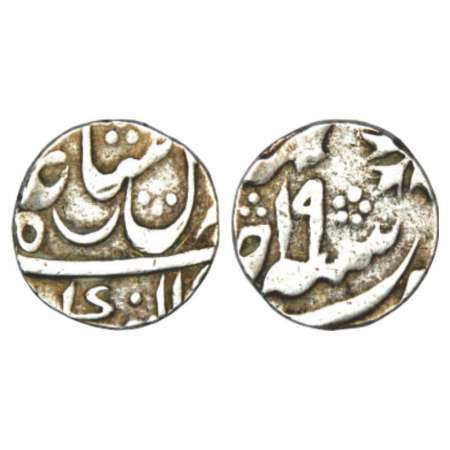 Murshidabad mint, silver ¼ rupee, 2.91g, in the name of Shah Alam II, AH 11xx/RY 19, PR 150; Stevens EIC 2.188. Prinsep Issue, copper 1/8 anna, Pulta mint, in the name of Shah Alam II, AH 1195/RY 22, plain edge, 19.6mm, PR 197; Stevens EIC 3.24. 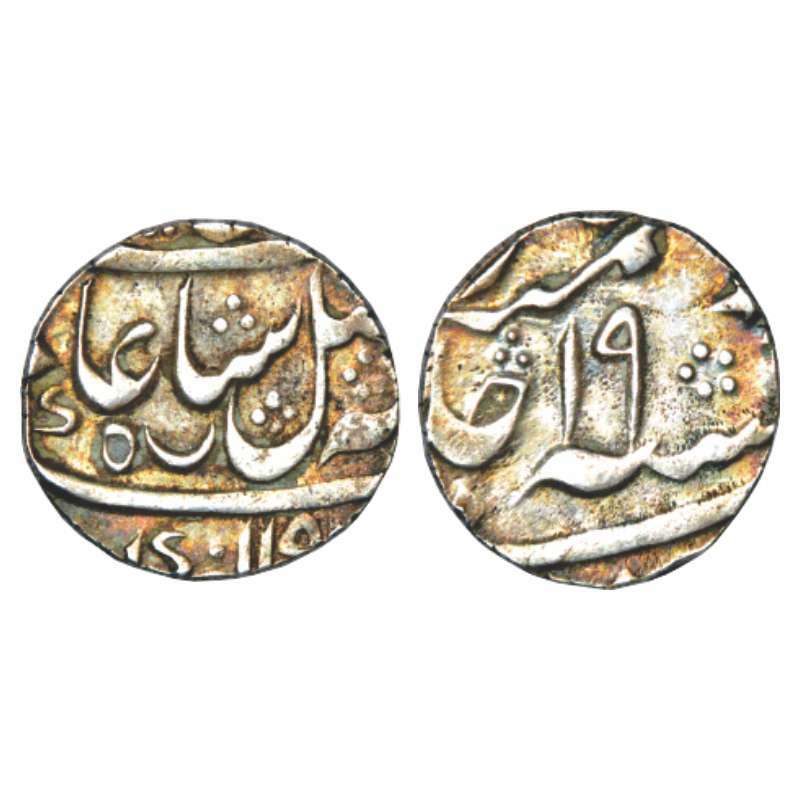 Graded as MS62BN by NGC, Rare in this grade. 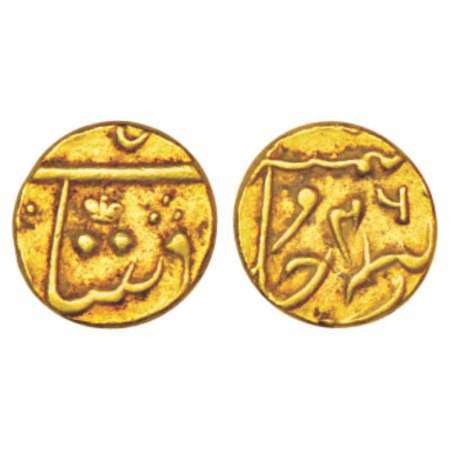 Bombay mint, Panchia (1/3rd Mohur), in the name of Shah Alam II, privy mark 4, PR 263, 3.86g. 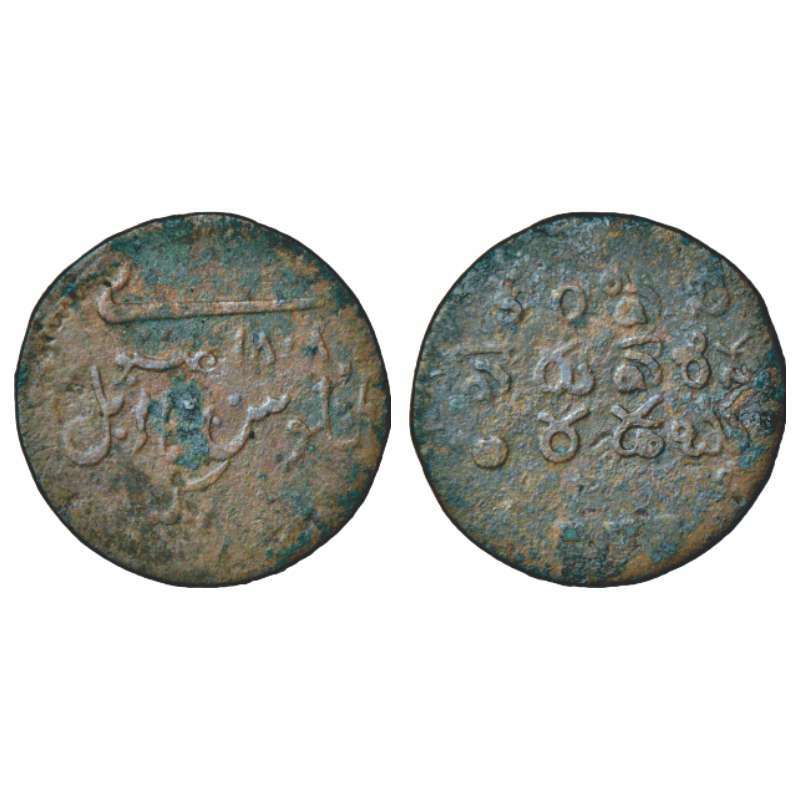 Bombay mint, copper ¼ anna, AD 1830. 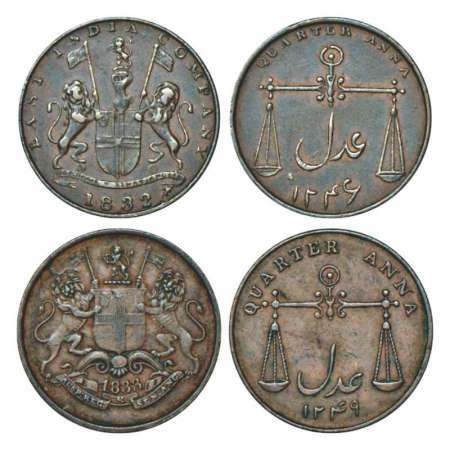 Obv: Coat of arms of East India Company and date. Rev: Scales with Persian Adil and AH date 1246, PR 205; Stevens EIC 5.16. 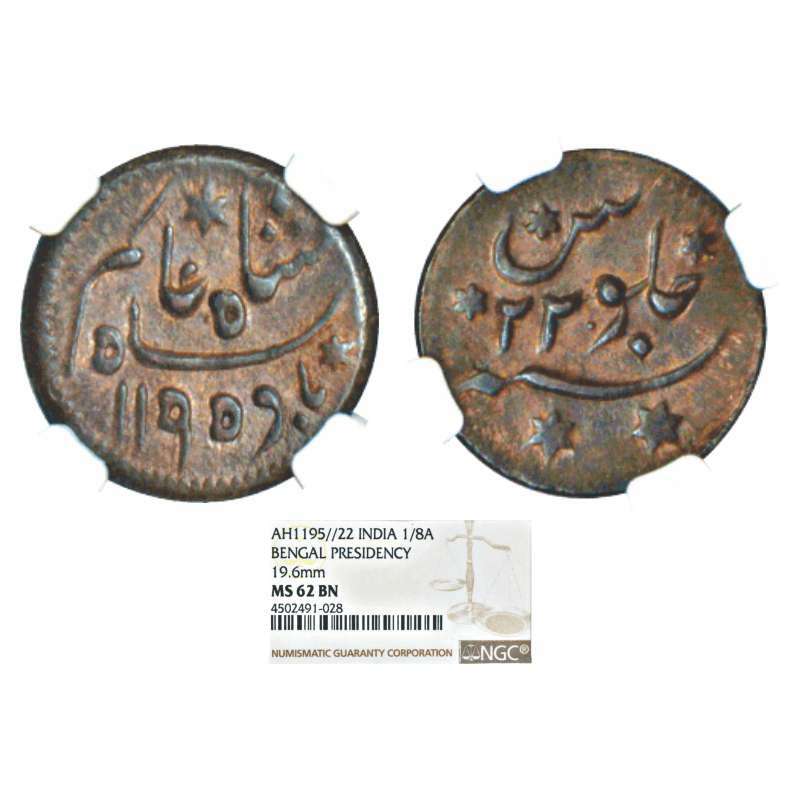 Graded as AU53 BN by NGC, Very scarce. Soho mint, copper ½ pice, AD 1791, 3.15g. 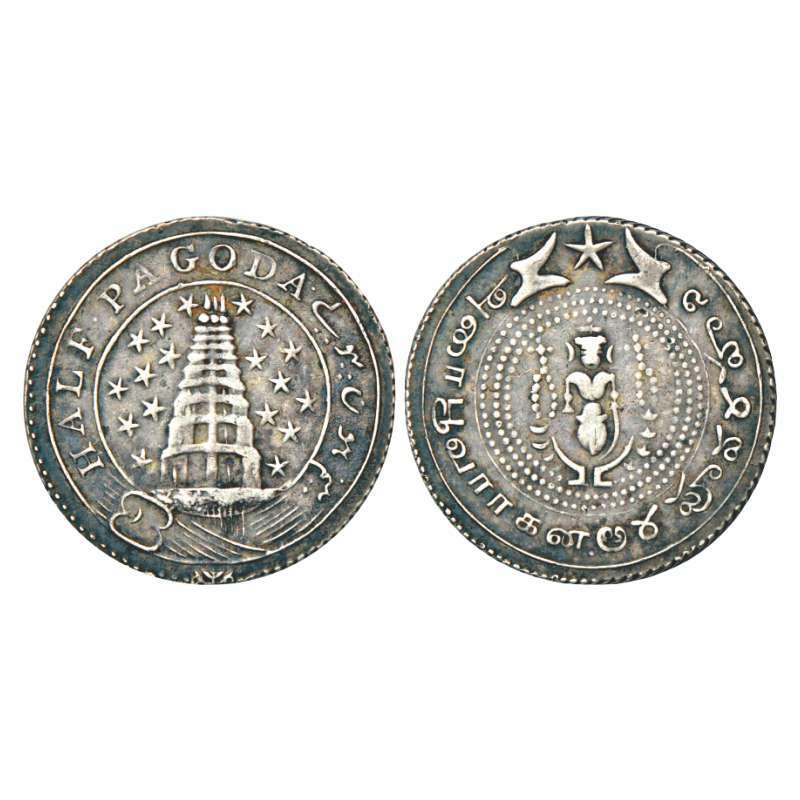 Obv: Bale mark with date below. Rev: scales and Persian Adil, 20.22mm, Edge grained right, PR 135; Stevens EIC 8.36. 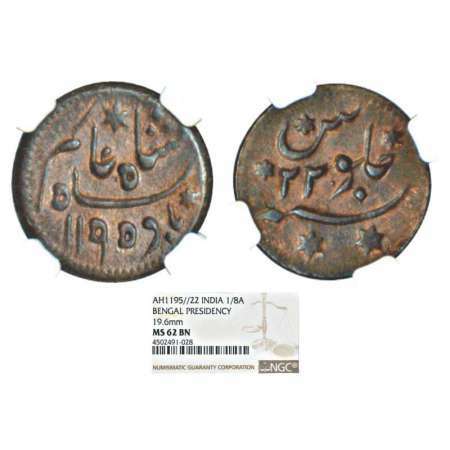 Soho mint, copper proof ½ pice, 3.14g, AD 1804. Obv: E.I.C. arms below date. 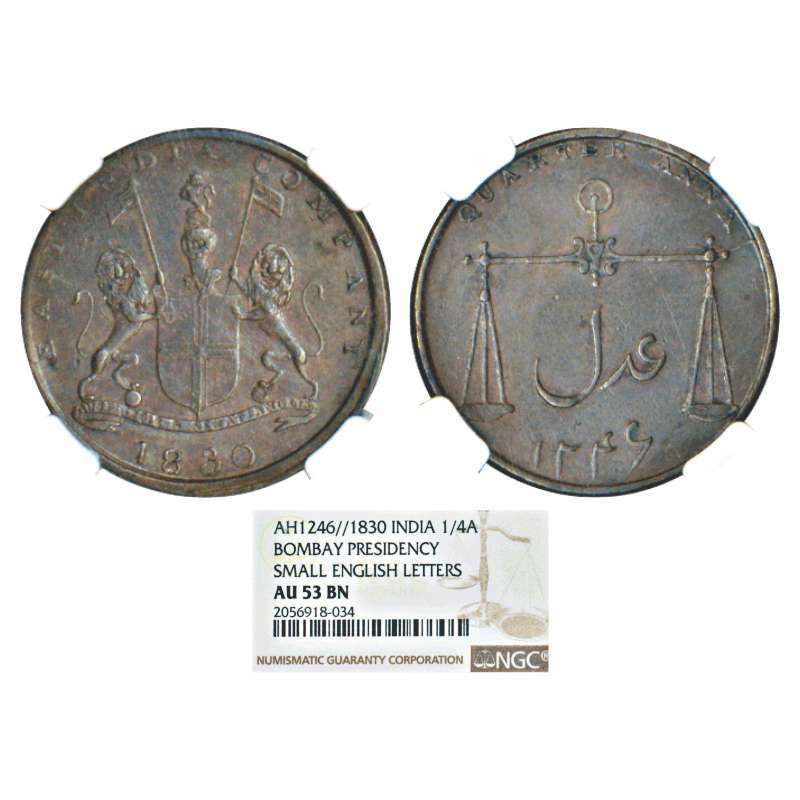 Rev: scales and persian adil, below AH 1219, PR 202; Stevens EIC 8.61. Surat mint, gold 1/3 mohur or panchia, 3.86g, ND (1800-1815 AD), struck in the name of Shah Alam II, privy mark 1, PR 251, Stevens EIC 6.157, 14.03mm. 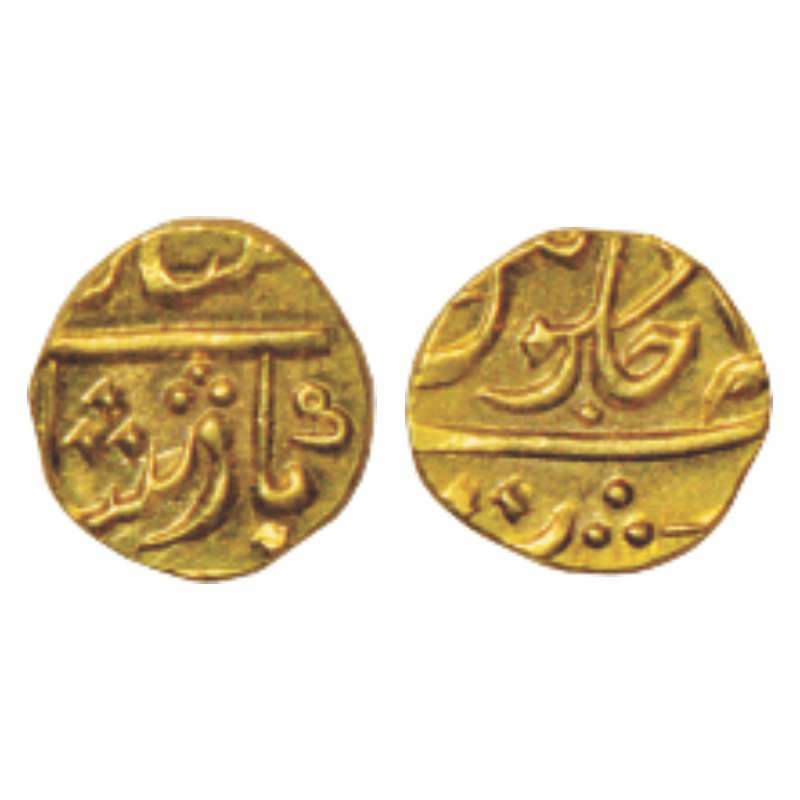 Surat mint, gold 1/15 mohur (rupee), 0.77g, ND (1800-1815 AD), struck in the name of Shah Alam II, KM 213. 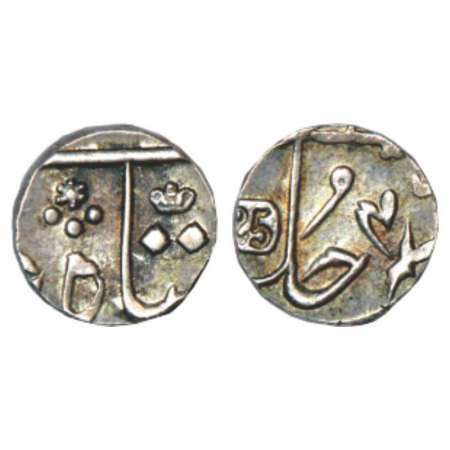 Surat mint, silver ½ rupee, 5.89g, AD 1825, in the name of Shah Alam II, dated 1825 incused, RY 4(6), privy mark 8, PR 277; Stevens EIC 3.22. 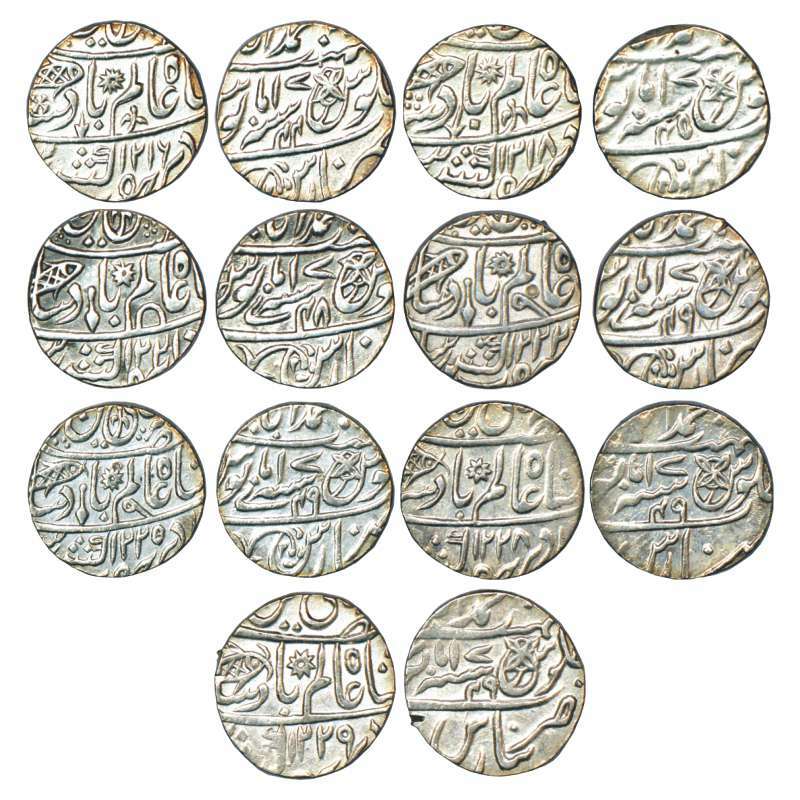 Surat mint, silver ½ rupee, 5.81g, AD 1825, in the name of Shah Alam II, dated 1825 incused, RY 4(6), privy mark 8, PR 277; Stevens EIC 3.22. 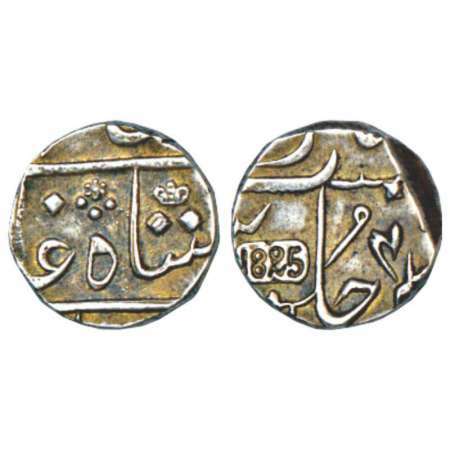 Surat mint, silver ¼ rupee, 2.96g, AD 1825, in the name of Shah Alam II, dated (18)25 incused, RY 46, privy mark 8, PR 278; Stevens EIC 3.25. Arkat mint, silver ½ rupee, in the name of Alamgir II, AH 1172/RY 6, open-lotus type, PR 253; Stevens EIC 4.13-4.14. 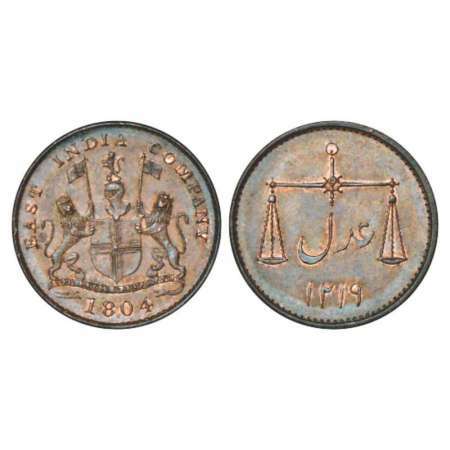 Madras mint, copper 40 cash, ND (1807), 19.06g, C/III type. 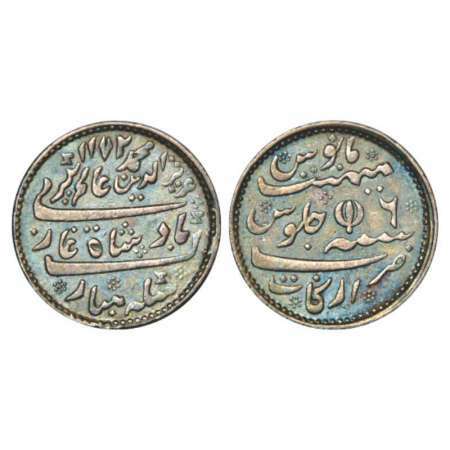 Obv: value in Persian and English. 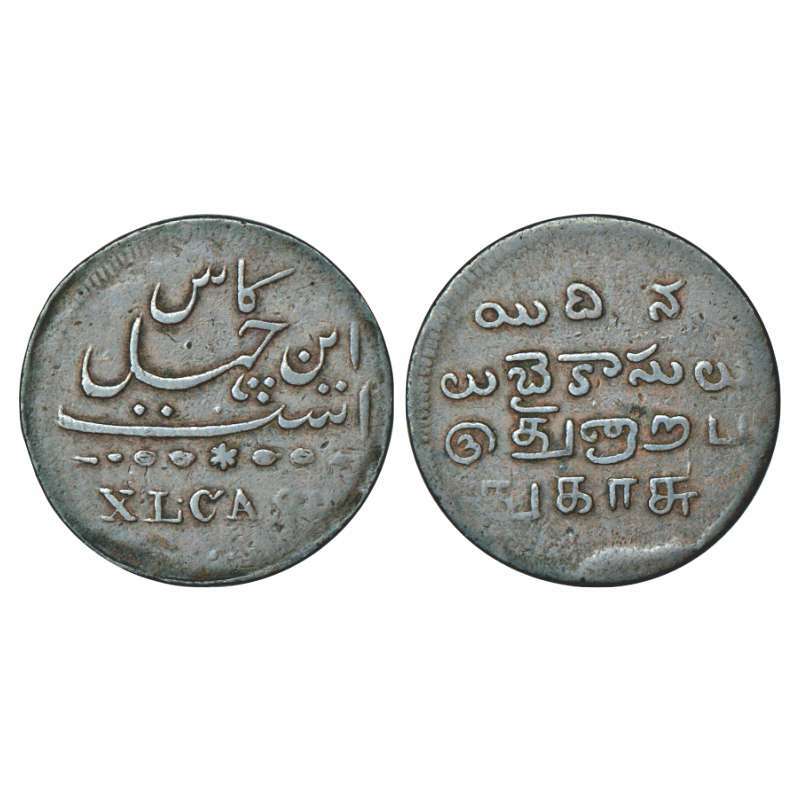 Rev: value in Tamil and Telugu, Stevens EIC 3.285, 35.87mm. 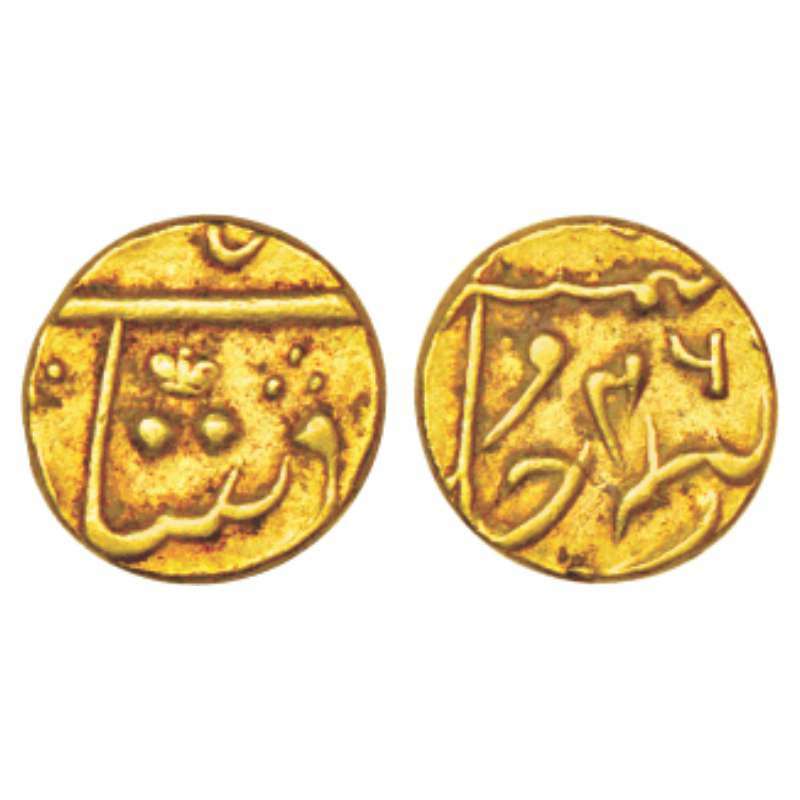 Very fine+, Very rare in this grade. 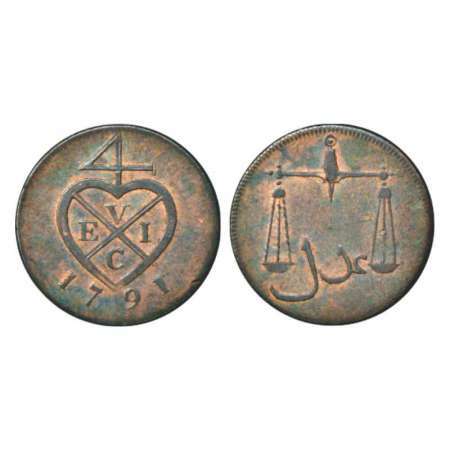 Madras mint, copper 5 cash, ND (1807), 2.08g. 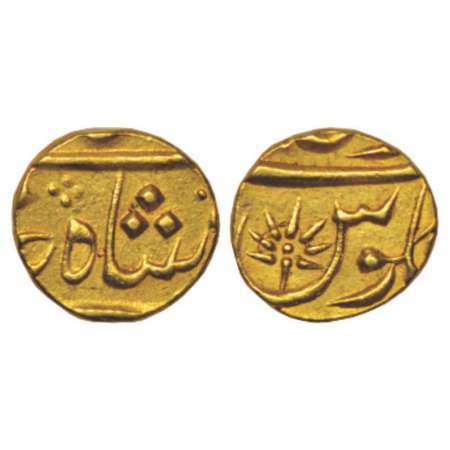 Obv: value in Persian and English. 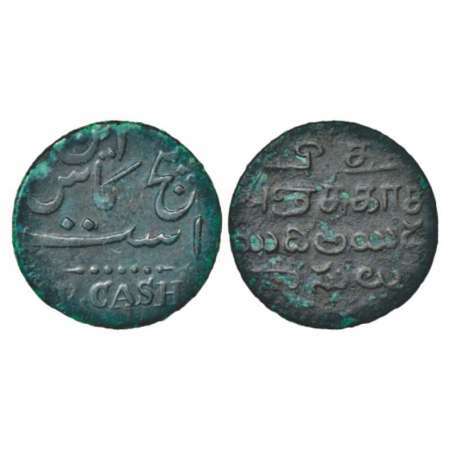 Rev: value in Tamil and Telugu, 19.69mm, plain edge, PR 234; Stevens EIC 3.332, green deposit. Madras mint, copper 2½ dub, 1.21g, AD 1807. 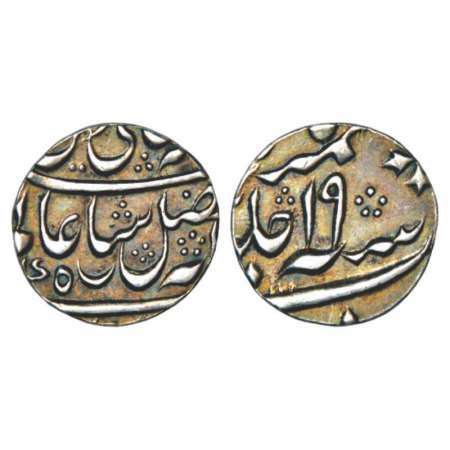 Obv: Persian and English legend in 2 lines. 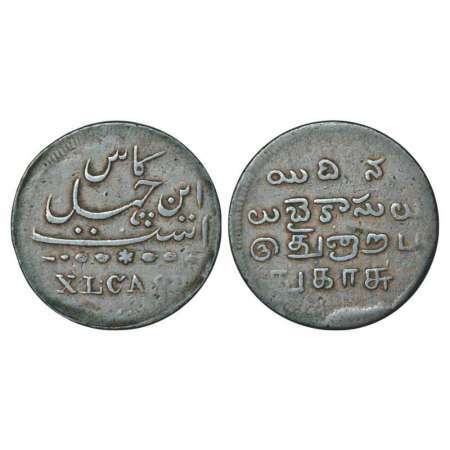 Rev: value in Tamil and Telugu, plain edge, 15.89mm, PR 236; Stevens EIC 3.336. Madras mint, copper ½ dub, 5.01g, incorrect date 7107 error for 1807. 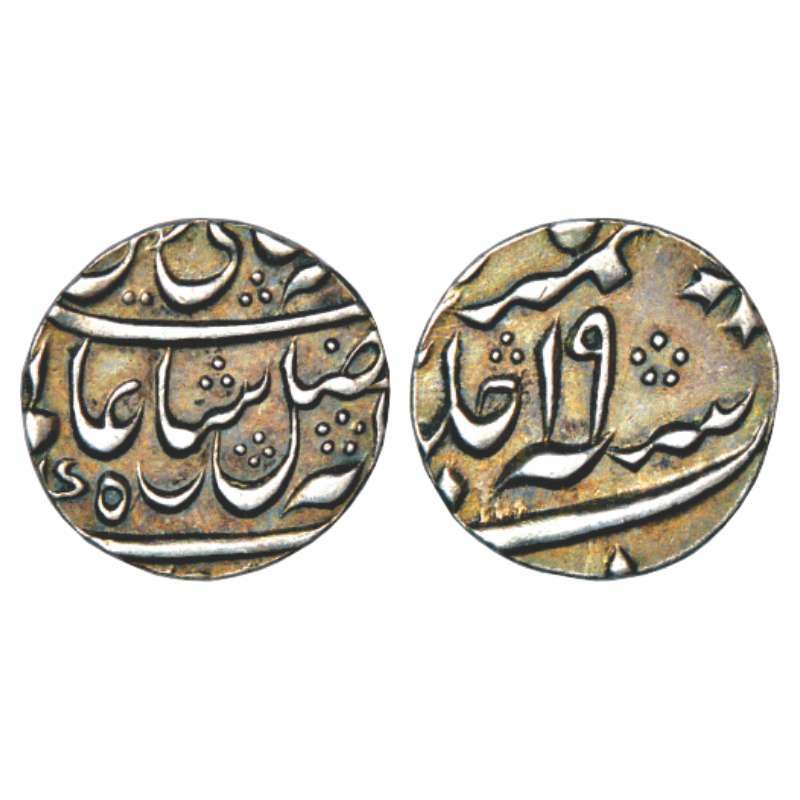 Obv: Persian legend in four lines. Rev: value in Telugu and Tamil, plain edge, 21.84mm, PR 330; Stevens EIC 3.363. 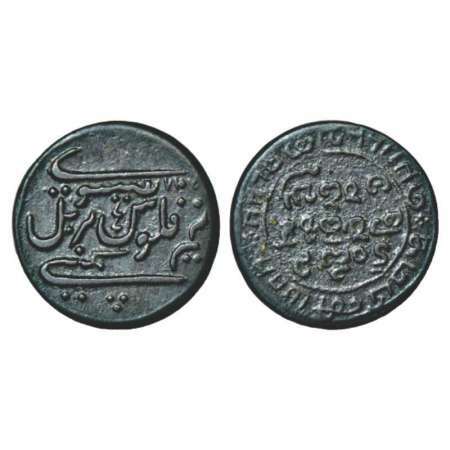 Madras mint, copper ½ dub, AD 1808, 4.16g. 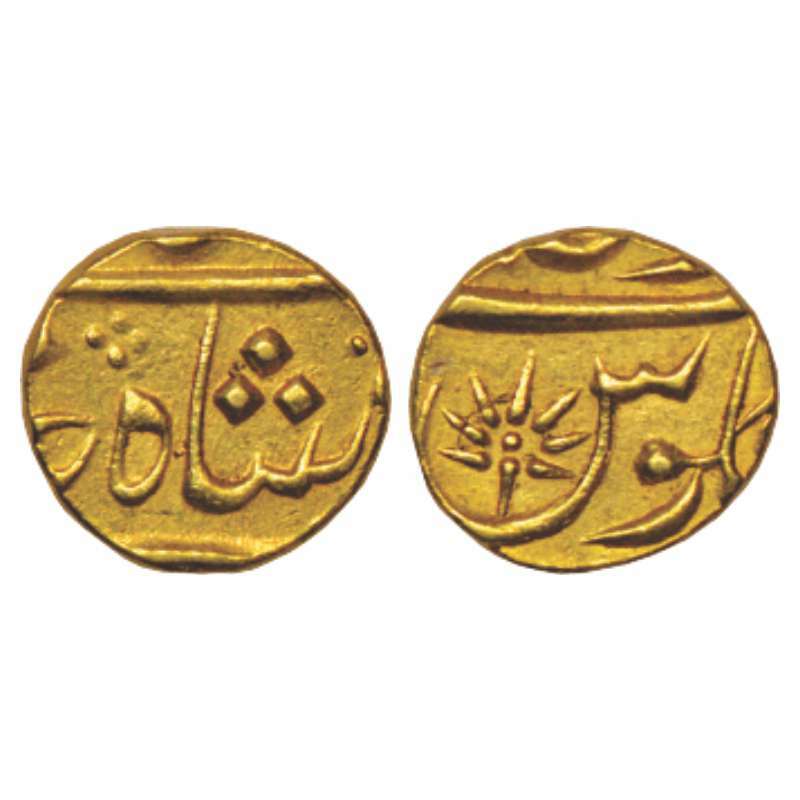 Obv: Persian inscription in four lines and date. 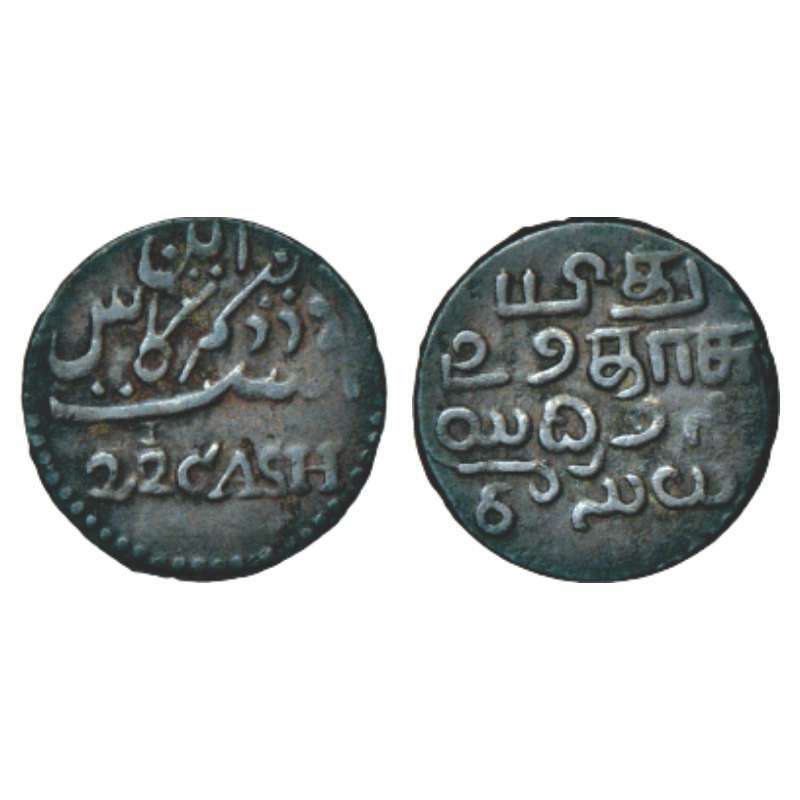 Rev: value in Telugu in three lines below ½ dub in English (indistinct), 25.70mm, plain edge, PR 335; Stevens EIC 3.371. 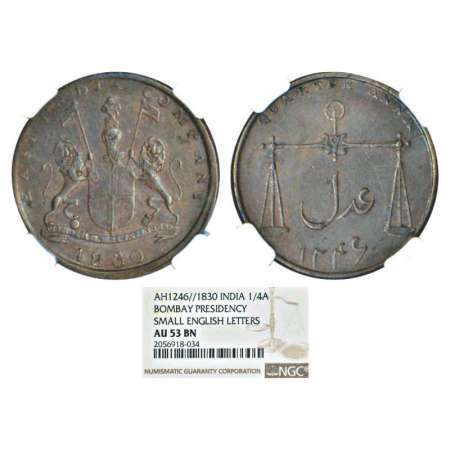 Madras mint, silver ½ pagoda, second issue, ND (1808-1812AD), 21.25g. Obv: value in English and Persian, buckled garter, 9+9 star around both side of Gopuram. Rev: value in Tamil and Telugu around deity Vishnu, KM 353; Stevens EIC 3.134. 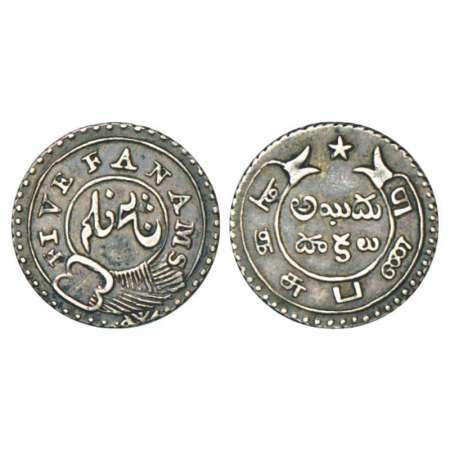 Madras mint, silver 5 fanam, second issue, ND (1808-1812AD), 4.69g. 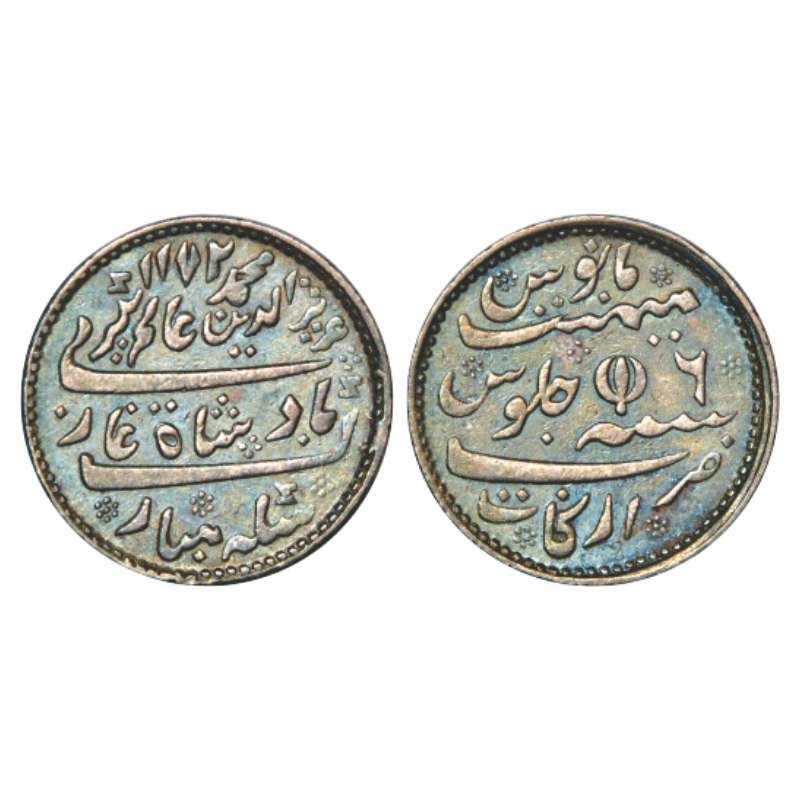 Obv: value in English and Persian. Rev: value in Telugu and Tamil, KM 351; Stevens EIC 3.231.